It's tis the season for the girls adorned in patches to be standing outside the grocery store. It's one of my favorite sights....rows and rows of those tasty treats. But this year I had some self control and only bought one box. That's right, I didn't come home and align my freezer with thin mints and samoas. I'm trying this self control thing out, I wonder how many crunches I have to do to counteract that box of samoas. 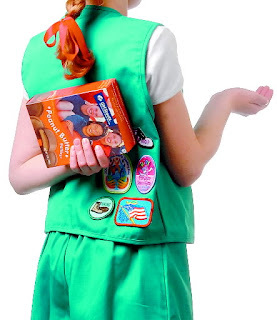 While we are on the subject of girl scouts those addictive cookies have sent people over the edge...people are trying to scam the girl scouts using counterfeit money! I can't even believe there are people out there that would stoop so low. Check out this article about a couple that ripped off a troop in Colorado. Very proud of you. I was trying to control myself and only bought two boxes myself. Of course we've eaten them all already. Waiting again for next year already. oh mine were gone the day that I bought them. I can never have that much self control!